This recipe is extremely easy to make and takes around 30 minutes from prep to finish! Use beef or lamb (whatever your preference). If you want to cheat: use Shan’s Chop/Steak Mix mix found in most Indian grocery stores. Otherwise, use the following spices. Spices: 1/2 tsp chilli powder, 1/2 tsp cumin powder, 1/2 tsp curry powder, 1/2 tsp coriander powder, 1/4 tsp oregano, and 1/2 tsp salt (or to taste). 1/2 tsp ginger and garlic paste. Skewers (optional). Please note that if you are going to use skewers, soak them in hot water first for atleast 20 minutes in order to get rid of any splinters. 1. Cut the meat of your choice into cubes and wash well. Allow to dry or pat dry using a paper towel. 2. In a bowl, add the meat along with all the spices and the lemon juice and mix really well. Allow to sit for 10 minutes. 3. 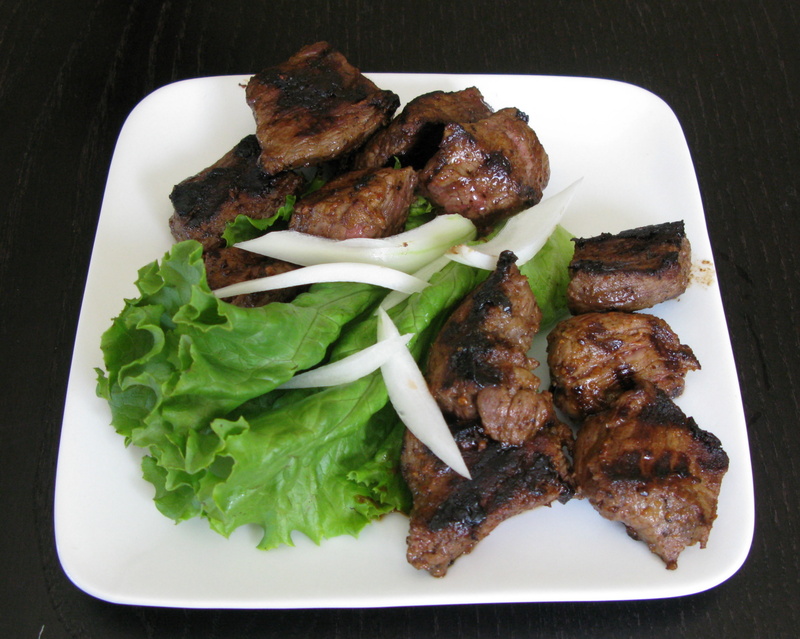 Using skewers, place the meat on the skewers with even gaps. Prepare all skewers the same. 4. Heat up the skillet/grill and spray with a touch of cooking oil. Grill the meat for 5-6 minutes on each side until done. You can of course add vegetables to the mix (such as courgette/zuccini – thinly sliced of course, pineapples, cherry tomatoes, mushrooms, and onions). 5. Decorate on a plate with some cut fresh veggies such as cucumber, tomatoes, or baby carrots on the side. Alternatively, if you do not have skewers, you can just grill the meat on the grill as is. The result is the same. Recommedations: For a mediterranean feast, serve with pita bread and/or rice, hummus, and salad. Can also be eaten Deshi style with rice, salad and some plain yogurt (mixed with a bit of mint sauce) on the side. 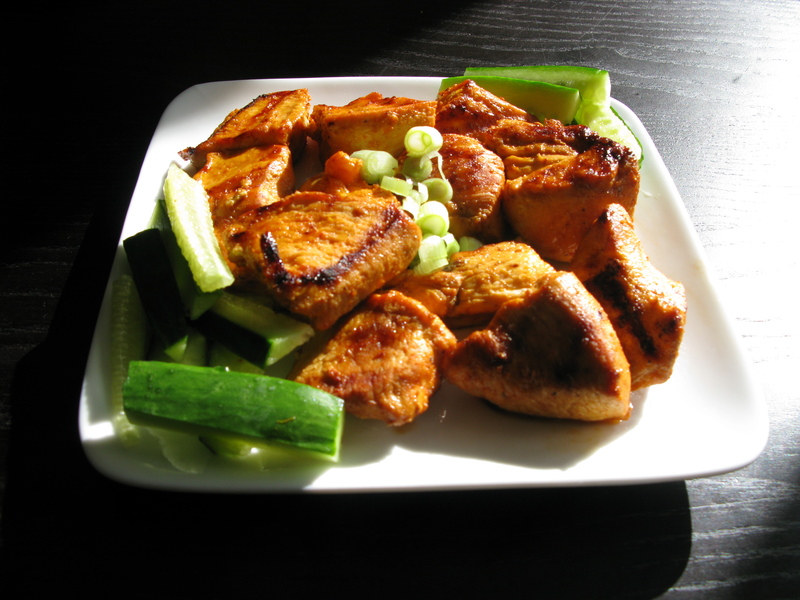 For a healthier low carb meal, serve the shish kebab with a salad from my “starters” page.